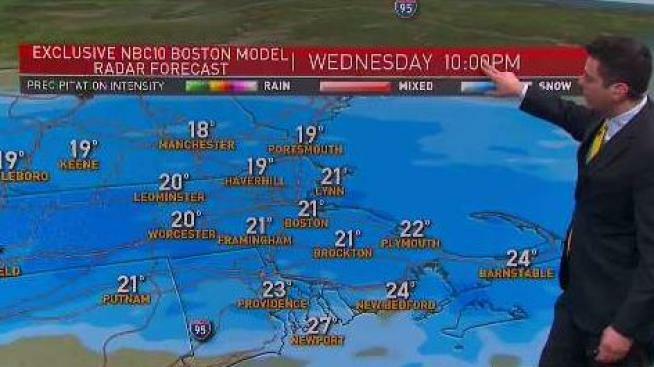 Western New England will see snow by sunset, with eastern Massachusetts and New Hampshire seeing snow by around 9 p.m. This is one of the colder mornings of the winter, but with high pressure right over us, at least the wind has let up. Temperatures start off below zero in the north, single numbers and teens south. We have some dim sunshine for a time Wednesday morning, but clouds thicken up during the afternoon. The exception is in the state of Maine, where it remains mostly sunny. Highs in the low-to-mid-20s south, teens north, and single numbers up on the ski lifts. A weak wave of low pressure on a warm front brings snow into western New England by sunset. Snow will advance to the eastern shores of New Hampshire and Massachusetts by about 9 p.m.
For a change, there is no snow forecast in central and northern Maine, and also for a change, there is no mix with sleet or rain in southern New England. For a few hours right in the middle the night, we may see snow at 1/2 to 1 inch per hour for a few hours. That yields a snowfall of 2 to 5 inches for much of Vermont, New Hampshire, Massachusetts, Connecticut, and Rhode Island. Snow shuts off at about sunrise or so in southeastern New England. Temperatures overnight hold in the 20s south and teens north. It’ll remain mostly cloudy in eastern New England Thursday, but become mostly sunny west and north. High temperature near 20 degrees north, and near 30 degrees south. Seasonably cold and dry high pressure should be here for our Friday, as a weak wave of low pressure misses well to the south. It may snow a little bit near Philadelphia and Washington DC Friday. High temperature in the 30s south, 20s north. The weather pattern remains incredibly active, with an endless parade of Pacific storms coming on the west coast. It takes two to three days for each system across the country, and the next one could be in here by Saturday afternoon or evening. We may end up with warmer weather, so it could be a snow or rain situation in a lot of southern and eastern New England, with more snow for the ski areas north and west. The early call is for a wintry mix to arrive Saturday evening and last through Sunday morning. Temperatures in the 30s south, and 20s north this weekend. Cold air comes back in Sunday night and Monday, with another coastal storm moving is off the east coast. It could be a close call on hit or miss, especially around Cape Cod Monday. And there’s another threat again Wednesday or Thursday. Obviously, confidence is low in the extended period, so stay ahead of the weather with our First Alert 10-Day Forecast.